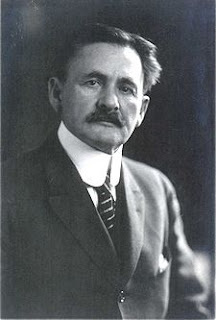 Albert Abraham Michelson was born on December 19, 1852 in Strenlo, Prussia (now Poland). His family moved two years later to Virginia City, Nevada where his father was a merchant. The family later moved to San Francisco, California, where Michelson first attended public school. He graduated in 1869 and President Ulysses S. Grant appointed him to the United States Naval Academy from which he graduated in 1873 and served for two years as an ensign on a cruise of the West Indies. After the cruise he he returned to the Naval Academy teaching chemistry and physics. In 1879 he was posted to the Naval Almanac Office. A year later he obtained a leave of absence so that he could go to Europe to continue his education where he visited the universities of Berlin and Heidelberg, and the College de France and the Ecole Polytechnique in Paris. Michelson was fascinated with the speed of light. While at Annapolis he had repeated the Jean Bernard Leon Foucault's 1850 measurement, improving Foucault's rotating mirror system. After two years of studying in Europe he resigned from the Navy in 1881. In 1883 he took a position as a professor of physics at the Case School of Applied Science in Cleveland, OH. There he concentrated on developing an interferometer to use in his experiments. In 1887 he performed, with Edward Morley, the experiment for which he is most famous. At the time it was believed that the earth (and everybody on it) was traveling through the aether, and electromagnetic waves (light) were affected by the movement of the aether. In order to test this effect Michelson and Morely used a light beam that was split in half and half was reflected in a right angle to the original beam. The light beams were then reflected back to the starting point where the interferometer was used to determine their velocities. The result was a null result and both light beams, traveling identical distances had both arrived back at the starting point at the same time, thus had equal velocities. This result proved that there was no aether and light could propagate at the same speed in any direction. For this work Michelson was awarded the Nobel Prize in 1907, becoming the first American to win the prize. He died on May 9, 1931.